Posted on June 13, 2014	by Katy K.
I was lucky enough to win this from Maureen at By Singing Light. I’ve enjoyed Rachel Neumeier in the past and was very excited to read this! 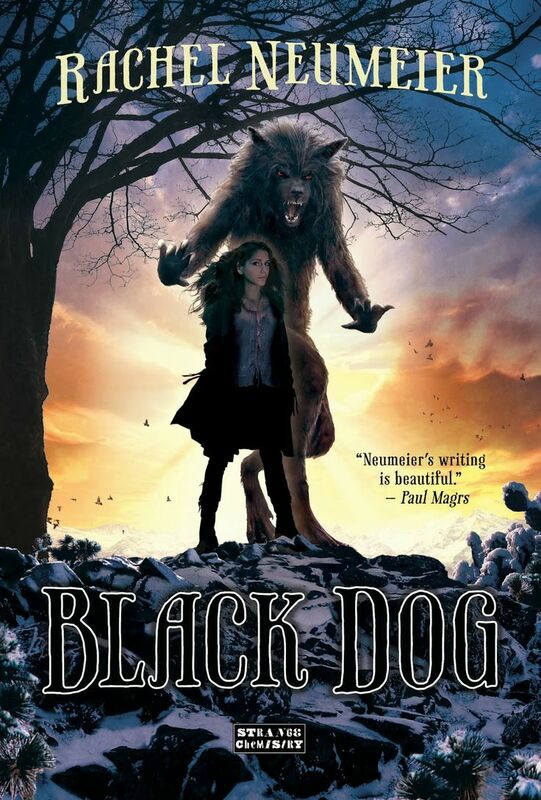 Black Dog by Rachel Neumeier. Strange Chemistry, 2014. In this modern-day fantasy, three siblings flee their village in Mexico that their enemies burned to the ground, for the dubious potential safety of Vermont. Alejandro is a Black Dog, able to shift between human and animal form. His sister, Natividad, is Pure, with the magic to help him control his Black Dog Shadow. Miguel is Natividad’s twin, not supernaturally gifted, but exceptionally bright and perceptive. With their parents dead, their only hope is that the strongest Black Dog clan on the continent will shield them from their enemy – but Black Dog clans are notoriously unfriendly to outsiders, and the Dimilioc is the least open of all. Their best hope is that the Dimilioc will be willing to trade shelter for the promise of Natividad marrying into the clan, with both sides skirting very uncomfortably around Natividad’s youth on the one side – she’s almost 15 – and the clan’s urgent need for new blood on the other. But their enemy, von Heusel, is more determined than they thought, willing to trail them all the way. He’s willing to turn as many people into the less-powerful moonbound werewolves as it takes to defeat the Dimilioc and take Natividad for himself. She needs to figure out the secret he thinks her mother taught her before it’s too late, all while managing the complicated dynamics of her own still grief-stricken family, their new place in Dimilioc, and the slight possibility of genuine romance with Ezekiel, the young Dimilioc executioner. You might have noticed that this book was on my top ten list for the year. I read it, and have already loaned it out twice to other people to read. Everything is in place, from the larger politics of the supernatural struggle that’s going on and the mechanics of the magic to the smaller details of personality and the shift to America. Natividad, in the blank white kitchen in Vermont, longs for the smells of her mother’s Mexican kitchen, and gets to work trying to make the Dimilioc house, also filled with loss, into a home, starting with homemade cinnamon rolls. I really like how cautious she is about getting romantically involved with anyone in her new place, precisely because she knows she will have to soon. She also walks a tightrope between needing to seem obedient because of the strict hierarchy of Black Dog society and having a very strong sense of what just needs to happen. I’m trying and failing to think of some part of this that didn’t work for me – not that everything was sunshine and rainbows, because clearly not, but everything made sense. I cared about the characters, and there was enough of a balance of tension with some lighter moments to make it very, very hard to put the book down. I really hope there will be a sequel. This entry was posted in Books and tagged contemporary fantasy, diversity, Latino/a, multiculturalism, teen fantasy, werewolves. Bookmark the permalink.